Hello Neat and Tangles Lovelies! As 2013 is winding down, thoughts turn from Christmas to New Year's. Are you planning to attend any super swanky shindigs? Katie here today to share a super simple gift idea for that special host or hostess. A bottle of wine almost always makes for a thoughtful host gift for holiday celebrations. 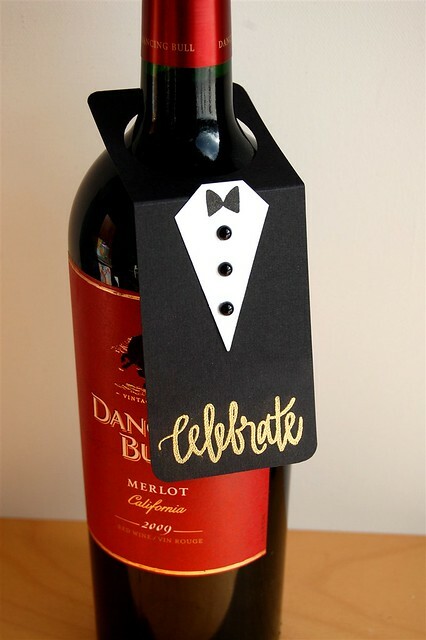 Using the Just for You set, I dressed up the bottle to make it suitable for even a fancy black-tie event. 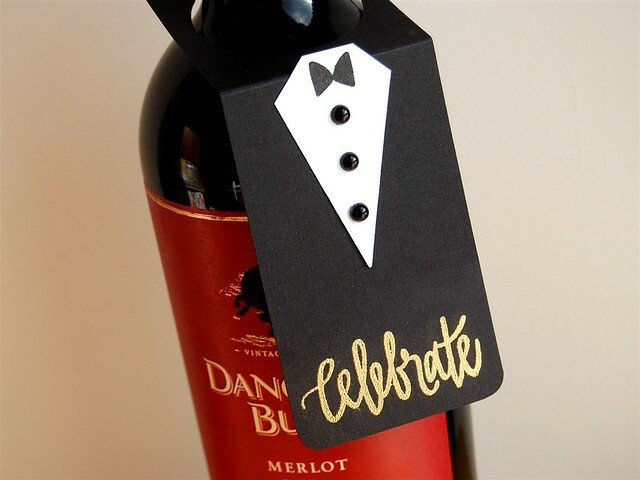 First, I created the wine tag by cutting a piece of black cardstock to 2.25 x 5.5" I punched a hole in the cardstock with a 1.75" circle punch and scored the tag at 2.25" Next, I die cut a triangle from white cardstock and trimmed the edges to create a gem shape. I stamped the bow and added three black pearls to act as buttons. I adhered the white cardstock to the tag. Finally, I stamped "Celebrate" in versamark and heat embossed the sentiment with gold embossing powder. Well that's all for me today. Thanks so much for stopping by and Best Wishes for an AMAZING 2014! Oh my goodness, this is the cutest tag!!! I love the black tie affair! Super cool - totally love it! That tag is to die for!